Professional formula for reducing pH in aquarium water. The water pH affects maintenance of the ecological balance in the tank and should be similar to the natural one. The species of fish from the Amazon prefer a slightly acidic pH of the water being 5.5-6.5. For some fish species, tap water requires lowering of pH. AF Minus pH allows to achieve it in a quick and easy way. Optimal pH ensures favorable breeding conditions and improves the condition of fish. Due to the possibility of overdose, this product is not recommended to be dosed directly into the aquarium. AF Minus pH should be prepared outside of the tank, in water destined to be changed. Before application, check pH level and only dispense product to the solution to reach the desired value. 1 ml AF Minus pH lowers the pH value by 0.2 unit per 1 litre of water. Due to the high harmfulness of sudden changes of pH level, do not lower the pH of the water in the aquariumProfessional easily absorbable nitrogen fertilizer for aquatic plants. Nitrogen is one of the most important macronutrients necessary for plants. The presence of nitrogen influences growth of the plant, its propagation and green coloration of leaves. Proper supplementation of nitrogen is essential as both deficiency and excess may be detrimental to plants. Nitrogen deficiency causes growth inhibition, chlorosis and yellowing of the leaves, and further browning. The excess, on the other hand, is manifested by excessive growth, dark green leaves, while the plant is very delicate and less resistant to mechanical damage. The appropriate level of nitrate in the plant aquarium should be 10-20 mg/l. Nitrogen is absorbed by plants mainly in the form of nitrate and ammonium. 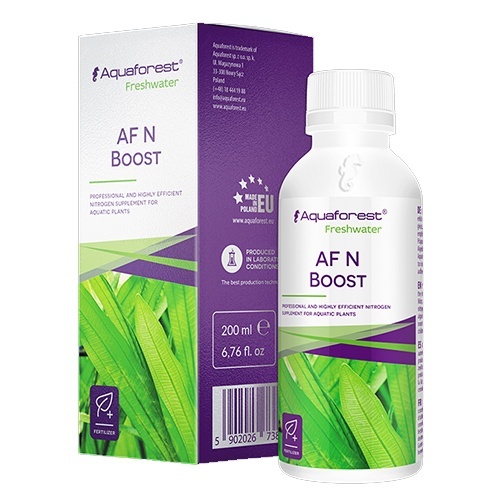 AF N Boost contains mineral nitrogen forms that are well absorbed by aquatic plants. 10 ml of AF N Boost dissolved in 100 l of water raises the nitrate level by 9.5 mg/l. Recommended parallel use with AF Micro, AF PO4 Boost, and AF K Boost. Do not use with other nitrogen-containing formulas due to the risk of plant overgrowth and algae bloom. by more than 0.5 per day.